Mathematical Preliminaries. Sets. Vectors and matrices. Linear inequality systems. Graphs. Graphs: basic notions. Graphs and vector spaces. Basic operations on graphs and vector spaces. Problems. Graph algorithms. Duality. Notes. Matroids. Axiom systems for matroids. Dual of a matroid. Minors of matroids. Connectedness in matroids. Matroids and the greedy algorithm. Notes. Electrical Networks. In terms of multiterminal devices. In terms of 2-terminal devices. Standard devices. Common methods of analysis. Procedures used in circuit simulators. State equations for dynamic networks. Multiports in electrical networks. Some elementary results of network theory. Notes. Topological Hybrid Analysis. Electrical network: a formal description. Some basic topological results. A theorem on topological hybrid analysis. Structure of constraints and optimization. Notes. The Implicit Duality Theorem and its Applications. The vector space version. &ast;Quasi orthogonality. Applications of the implicit duality theorem. &ast;Linear inequality systems. &ast;Integrality systems. Problems. Notes. Multiport Decomposition. Multiport decomposition of vector spaces. Analysis through multiport decomposition. Port minimization. &ast; Multiport decomposition for network reduction. Problems. Submodular Functions. Submodularity. Basic operations on semimodular functions. &ast;Other operations on semimodular functions. Polymatroid and matroid rank functions. Connectedness for semimodular functions. &ast;Semimodular polyhedra. Symmetric submodular functions. Problems. Notes. Convolution of Submodular Functions. Convolution. Matroids, polymatroids and convolution. The principal partition. &ast;The refined partial order of the principal partition. Algorithms for PP. &ast;Aligned polymatroid rank functions. Notes. Matroid Union. Submodular functions induced through a bipartite graph. Matroid union: algorithm and structure. PP of the rank function of a matroid. Notes. Dilworth Truncation of Submodular Functions. Dilworth truncation. The principal lattice of partitions. &ast;Approximation algorithms through PLP for the min cost partition problem. The PLP of duals and truncations. &ast;The principal lattice of partitions associated with special fusions. Building submodular functions with desired PLP. Notes. Algorithms for the PLP of a Submodular Function. Minimizing the partition associate of a submodular function. Construction of the P-sequence of partitions. Construction of the DTL. Complexity of construction of the PLP. Construction of the PLP of the dual. PLP algorithms for (&ohgr;R&Ggr;)(&dot;) and —(&ohgr;R&Egr;L)(&dot;). Structural changes in minimizing partitions. Relation between PP and PLP. Fast algorithms for principal partition of the rank function of a graph. The Hybrid Rank Problem. The hybrid rank problem - first formulation. The hybrid rank problem - second formulation. The hybrid rank problem - third formulation. The hybrid rank problem - fourth formulation. There is a strong case for electrical network topologists and submodular function theorists being aware of each other's fields. Presenting a topological approach to electrical network theory, this book demonstrates the strong links that exist between submodular functions and electrical networks. • a detailed discussion of submodular function theory in its own right; topics covered include, various operations, dualization, convolution and Dilworth truncation as well as the related notions of prinicpal partition and principal lattice of partitions. 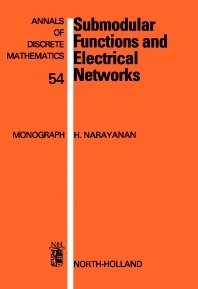 In order to make the book useful to a wide audience, the material on electrical networks and that on submodular functions is presented independently of each other. The hybrid rank problem, the bridge between (topological) electrical network theory and submodular functions, is covered in the final chapter. The emphasis in the book is on low complexity algorithms, particularly based on bipartite graphs. The book is intended for self-study and is recommended to designers of VLSI algorithms. More than 300 problems, almost all of them with solutions, are included at the end of each chapter.